Only about 10 weeks left now! The fatigue that I was afraid would come back with third trimester hasn't come to pass (yet) - I'm just mildly more tired, but I can also blame that on the difficulties sleeping still. I'm starting to learn how easy it is to overdo things now, since I'm getting some low back pain whenever I do. So I need to keep backing off or rearranging when I do household chores and gardening so that I stop doing everything on the weekends, since then my back usually ends up hurting for a couple of days afterwards. It started getting warmer this week - which makes me happy since I love summer - but with the heat came more swelling. The edema is mainly still in my feet (although I think my rings won't be making it until July), and I've had a couple of days now that by time I got home from work, it felt like I was walking on water balloons since my feet felt so much larger and squishier :\ And while I am noticing that I'm overheating much easier outside now, pregnancy has apparently gotten my body temperature to just the right level for my office :) Normally the A/C is a bit much there so that I still end up wearing sweaters in the summer, but now I'm at the perfect temperature and it's lovely. The baby's new trick this week was to develop what I'm calling the "pokey bits" - I don't know if it's elbows, knees, feet, whatever, but the baby has been sticking out various appendages in a way that has led me to hold my hand on the side of my belly to "hold the baby in". I realize the baby won't actually escape by kicking through my belly, but it definitely feels like it's trying sometimes. And it's quite visible from the outside! 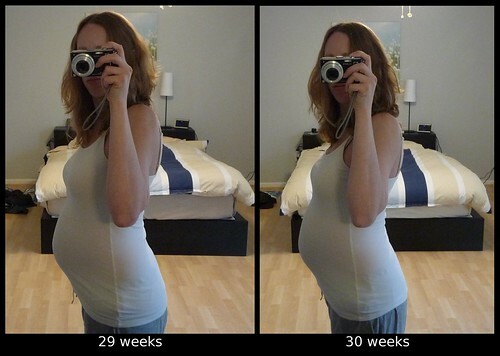 Before, we were able to see some movement from the outside but it was more subtle, while now sometimes the movement is enough to catch my attention when I'm not even staring at my belly (as I still like to do). Also, I realized this week that I can no longer see my feet without leaning forward... I knew this would happen eventually, but I think it still snuck up on me a bit. I went back to the midwives this morning for the first of my biweekly appointments. They confirmed that I passed the glucose test with "flying colors", which is awesome, and we talked a bit more about the Group B Strep situation. So it looks like instead of retesting me at 36 weeks as the nurse originally told me, they actually wouldn't bother since I already tested positive twice now and so they would want me on the IV antibiotics during labor regardless. But they did confirm that they would like to have one dose of the antibiotics in four hours before delivery (rather than at least two doses four hours apart, like I thought they would push for), and that even delivering one hour after the first dose has shown to do some good. Since my levels were just below where they would start to get concerned that the bacteria could start traveling to different systems and cause a kidney infection or other issues, I did agree to start the antibiotics now, although chances are the bacteria is just going to come back before labor. I'm hoping if the antibiotics get rid of it for a little while, though, and then if I go on probiotics and some other natural remedies that that would help keep the bacteria from coming back until after delivery, which would be my preference as more of a safeguard for the baby regardless of the IV antibiotics dosage. Besides that, everything looked great with the baby - I'm measuring about 31 weeks, the heartbeat was 155 bpm, and the baby is still head-down (and will hopefully stay that way! ).